Cozy cottage with great view of the Straits and Ediz Hook. Gaze across to Victoria. Less than 2 miles from the cottage you can catch the ferry to Victoria, Canada. In 40 minutes you can be up on Hurricane Ridge to hike the many trails, ski in the winter, or just marvel at the beauty of nature. Close to the marina and boat launch on Ediz Hook for your kayaking, sailing or fishing trip- we even have parking for your boat trailer. Minutes from Hwy 101 for trips to Salt Creek Park, Forks, Olympic National Park, the Pacific Ocean, and Cape Flattery. Magnificent Crescent Lake and Marymere Falls are just a 20 minute ride away. The Olympic Discovery Trail spans from Port Angeles to Sequim for walking, jogging or biking. Minutes to downtown shopping, art around the town, Webster's Woods and the Fine Arts Museum. To stock up on supplies the grocery store is less than 3 miles away. Port Angeles hosts many festivals throughout the summer months. Spacious upstairs bedroom has panoramic view of the Straits across to Victoria, the San Juan Islands, and Mt. Baker. Watch the cruise ships and boat traffic on the Straits or delight in a summer sunset. Enjoy a sunny breakfast on the outdoor patio and watch the deer when they come to lounge in the yard. Have a BBQ or just sit on the patio and enjoy the view and the evening breeze. The cottage has an electric fireplace, Cable TV, VCR/DVD with limited titles. The full kitchen has a DW and microwave as well as a full compliment of appliances. A washer/dryer combo is provided for your convenience. 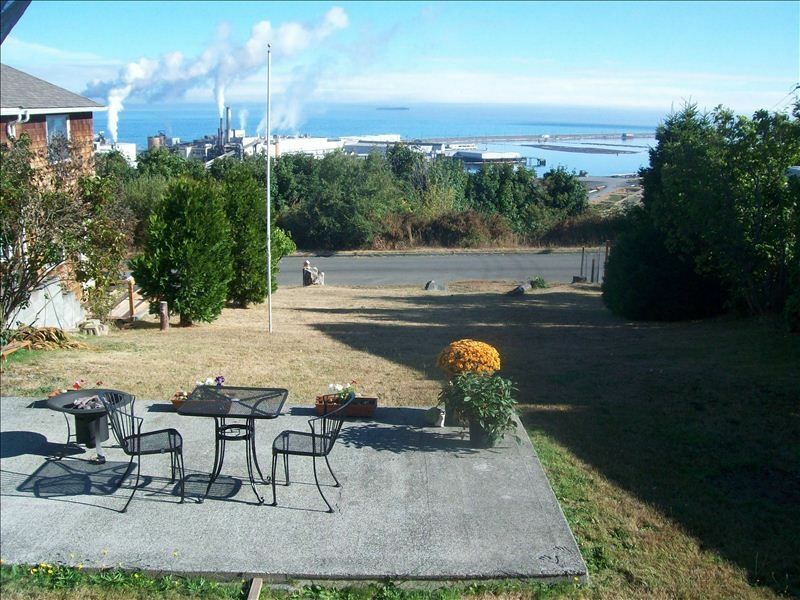 We feel in love with Port Angeles in 2009 and found a home that let us connect with the sea. We love watching all the activity in the Straits and have a little group of deer that love to lounge in the yard. The Port Angeles Community is vibrant with many weekend festivals throughout the summer and the Olympic Peninsula offers unlimited opportunities for hiking and exploring. Art is alive from downtown sculptures and galleries to the Fine Arts Museum and Webster's Woods. We hope you enjoy your stay and come to love the North Olympic Peninsula as much as we do. toilet, combination tub/shower, shower, There is a step down into the bathroom. Peek out at the Olympic Mountains in the background. Each room has its own heater. Electric Fireplace for warmth or ambiance. Coffee, tea, creamer and sweeteners are available. As well as waffle maker, George Foreman Grill, blender and mixer. Great view of the Straits from the patio. Table and chairs for outdoor dining, relaxing. Comfortable house. Quiet location near ample amenities. Cute cottage by the sea! This place was perfect for us, and it had everything we needed including kitchen supplies to cook meals. The pictures online don’t do the view justice. It was absolutely beautiful! When we return, we will stay here for sure. Thanks for sharing your wonderful home! This home was very welcoming, clean and comfortable. Beautiful view. Relaxing home and easy to get to. We arrived in Port Angeles and were happy with the cottage. It was clean and comfortable. The location was an ideal base for further exploration of the area and the owner was very helpful. We would rent this little house again if we are in the area. The cottage was put to the test while we were visiting during the unusual 70 year snow storm and we remained warm, at least while inside the cottage! Perfect for our quick trip to Port Angeles! The home was cozy and had everything we needed for a quick weekend away at a basketball tournament. We had a great time visiting Port Angeles. The cottage had beautiful views, all the kitchen items one would need for a vacation home, and pretty, comfortable bedrooms. We will definitely be back. We loved the location and how quick it was to go to downtown, out to the Ediz Hook for a walk or go adventuring towards Macah Reservation and Sapho. A perfect relaxing weekend! Thank you so much Marie for letting us stay!